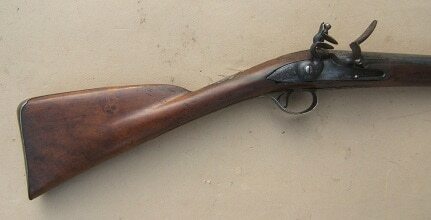 A FINE+ & RARE GEORGIAN-COLONIAL/FRENCH & INDIAN WAR PERIOD ENGLISH FLINTLOCK “TRADE FOWLER” w/ EVIDENCE OF AMERICAN COLONIAL USE, by T. PEELE, ca. 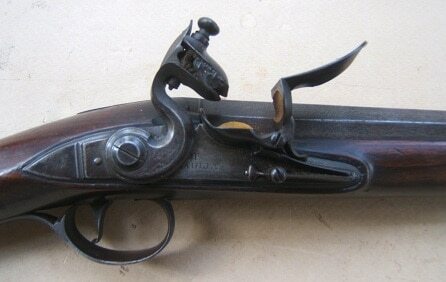 1730: In overall fine+, generally untouched original flintlock condition. Fine quality lightly engraved, round, smoothbore, key-fastened, 42 1/2″, (16 Ga.)/.65 caliber, steel barrel with a scroll engraved barrel-tang/rear sight. Slightly flared muzzle, a silver foresight, two (2) early Birmingham proof-marks and a hooked-type breech. A fine touch-hole and smooth steel gray surfaces with some scattered light patches of rust-staining/discoloration and the breech-top with a “W. T. HAVEN” (Whitehaven) address, within a balloon-type border. 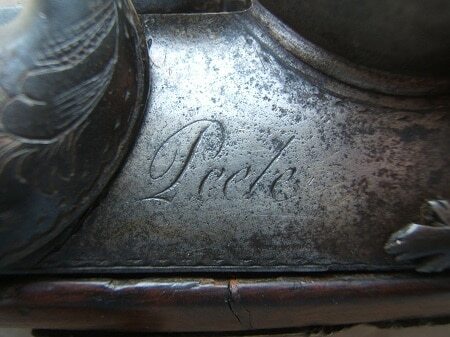 Retains an untouched, silver-gray age patina with some light discoloration and expected fine pitting, at the touch-hole/breech: marked on the left side, with an “T.P” maker’s mark, for Thomas Peele of Whitehaven, UK, who w. 1721-1730 (please see “Gunmakers of London 1350-1850”, pg. 157). Molded and carved, nicely figured, Walnut fullstock of classic Georgian design with a sculpted and deeply fluted comb and a finely executed raise carved scallop-shell apron, at the barrel tang: simple raised carvings of “trade type” design around the mounts. Nicely chiseled and engraved steel mounts with lightly polished (65%+ finish) surfaces and some scattered light discoloration. 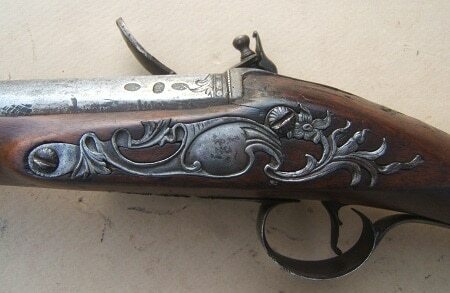 The trigger-guard with an etched and chiseled acanthus leaf forward finial and an engraved “Tudor Rose” on its bow. The buttplate with a stepped and finely scroll engraved tang: the top marked with an old illegible “9?0?” collection number, in red paint/ink. Three (3) barrel-form ramrod pipes, a vacant shield-type wrist escutcheon with an embossed acanthus leaf finial; and a finely embossed and engraved vine-scroll-type openwork sideplate. Retains both of its sidebolts. The lock with smooth steel surfaces, 70%+ polish and a clearly engraved “PEELE” signature (Thomas Peele), under the bridled powder-pan. In mechanically functional order with a strong mainspring and fine timing: hound’s-tooth engraved borders– the gooseneck hammer, its top jaw and the trefoil finial frizzen-spring, en suite. American refaced frizzen and a working-period solder repair, to the hammer’s bottom jaw. In overall fine untouched condition with choice steel and wooden surfaces. The barrel with 75% polish, sharp contours, a finely toned age-patina, clear markings and a fine touch-hole. Fine “Trade Type” walnut fullstock with 85%+ finish, sharp contours, classic rococo/Georgian Period carvings, at the barrel-tang and some wear, at the edges of the lock mortise. Expected minor handling marks, old tight hairlines on the forestock and general signs of use and light wear. The mechanism with choice surfaces, a clear maker’s signature and a strong mainspring: the frizzen with an American working-period re-facing. Retains its original horn-tipped wooden ramrod. 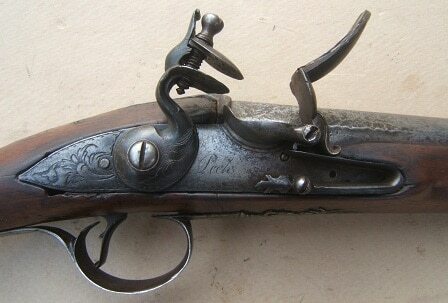 A very nice example of a scarce French & Indian War/Colonial Period English Flintlock “Trade Fowler”, ca. 1730. 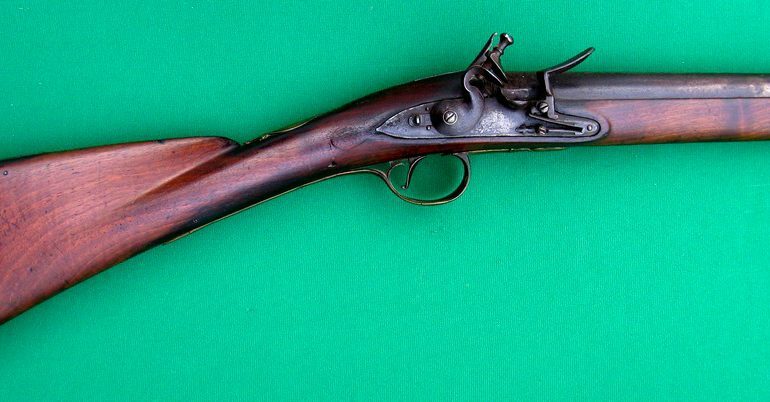 The type of early Trade Gun often used by Colonial settlers. For similar examples and additional information, please see G. W. Neumann’s: “Battle Weapons of the American Revolution”, pg. 202, 203 & 204 and Kit Ravenshear’s: English Commercial Guns…”. Recently discovered in an old Maryland Estate Collection. Overall length, 60″.